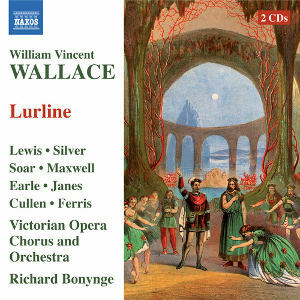 William Vincent Wallace may not be a household name to today’s music-lovers but from 1845 until the end of the 19th century he was very popular as an operatic composer. He is not completely forgotten, however, and I knew at least an excerpt from his first opera, Maritana, from a Joan Sutherland record. On Marco Polo there is also a complete recording of the opera. Excerpts from Maritana coupled with music from a couple of other roughly contemporaneous British operas are available on EMI and on the Australian label Melba Deborah Riedel sings several Wallace arias plus others by Balfe, Faraday and Sullivan. Ms Riedel was scheduled to sing the role of Ghiva on the present recording of Lurline but died before the project could be carried through. The recording is dedicated to her memory. The libretto is based on the legend of Lorelei, the 132 metre high rock on the eastern bank of the Rhine. In Heine’s poem Die Lore-Ley a kind of siren sings from the outcrop and distracts shipmen so that they crash into the rock. In this opera she falls in love with a human being, a young nobleman. When the River King hears this he knows that this will lead to her death. How the story ends I won’t reveal, which is a sneaky way of forcing readers to buy these two discs to find out. And it is worth the moderate costs, since the music is wholly agreeable and the singing and playing, despite some blemishes, on a quite high level. The performing edition is by Richard Bonynge, who has done great things in dusting off long-forgotten operas and giving them a new lease of life. One can at once in the long overture hear that Wallace was a skilled orchestrator. The opening is an atmospheric description of a moonlit night on the Rhine, but the music becomes both lively and dramatic. When the imaginary curtain rises we are exposed once more to a serene and beautiful orchestral introduction, which is also woven into the recitative that follows and sung at the end before the aria. So what does the music sound like? The easiest way of describing it is to see it as a forerunner of Sullivan. In a blindfold test I am sure many listeners would believe some of the melodies to be from one of the Savoy operas. Ingratiating and easy to hum they could comfortably command a place in any programme of light opera and operetta. What is missing is perhaps the tongue-in-cheek quality of some of Sullivan’s best creations and the glint in the eye. On the other hand the story doesn’t exactly cry out for such qualities. There are also several rousing choruses that remind me of G&S and the act finales are skilfully structured to rise to slap-up climaxes. In particular it is in the second act that Wallace’s inspiration flows at its richest. Take the opening chorus (CD 1 tr. 19) or the Sullivanesque Chorus From his Palace of Crystal (CD 1 tr. 22). Rupert’s aria Sweet form (CD 1 tr. 23) is lovely and somewhat later Ghiva’s song Gentle Troubadour (CD 2 tr. 2 is catchy. Rhineberg’s The nectar cup may yield delight in ¾ time (CD 2 tr. 5) is another hit. No wonder it was such a success in the 1860s. Act III also has several highlights. Rupert’s ballad (CD 2 tr. 13) again recalls G&S and Lurline’s Grand Scena (CD 2 tr. 18) should be a dream number for any high soprano. The prayer, in particular, is noble and beautiful. The final scene opens with a riveting chorus (CD 2 tr. 22) followed by a long duet between Rupert and Lurline. In the ensemble that concludes the opera Lurline returns to her opening solo in act I but now heavily embellished. Sally Silver in the title role has a bright lyrical voice, sailing effortlessly up in the highest reaches of the soprano register. She negotiates the coloratura passages with supreme ease. Hers is a most sensitive reading of a role that is both other-worldly and deeply human. Veteran Keith Lewis, best known perhaps as a stylish Mozart singer, makes the most of Rupert’s role, nuanced and sensitive, but today his beautiful voice is afflicted by a disfiguring wobble on sustained notes. This is, however, compensated for by his ravishing pianissimo singing. The end of his air (CD 1 tr. 23) is excellent proof of his ability. David Soar is a powerful and intense Rhineberg but slightly strained at times. Donald Maxwell, another veteran, is a splendid Baron Truenfels and even better is Roderick Earle as the Gnome. Try CD 1 tr. 27 for proof. Fiona Janes is a vibrant and expressive Ghiva. The orchestral and choral forces are splendid under Richard Bonynge’s experienced leadership. There is a synopsis in the booklet but the libretto - including the original stage directions shown in the 1860 libretto - can be bought separately. See below. Victorian Opera Northwest, which ‘was formed to promote the excellent music found in the operas and operettas of forgotten 19th Century British and Irish composers has certainly lived up to their aim. Together with Naxos they have enriched the operatic CD-catalogue. Maybe not a dramatic masterpiece but all lovers of 19th century opera, and lovers of good melodies should hasten to add this set to their collections. This CD Commemorative libretto booklet is available at £3 (includes UK p&p) from 6 Lindow Fold, Wilmslow Cheshire SK9 6DT with cheque made payable to 'Victorian Opera'.